An aerial view of the Village Commons, which is at full occupancy, and has been for most of this century. When Andy Yee talks about South Hadley, he speaks from experience. He grew up there, went to high school there, lives there still, and now watches his children’s high-school games there. He also does business there — quite a bit of it, actually. He owns a number of restaurants in that community, including Johnny’s Bar & Grill and Johnny’s Tap Room, both named after his late father, as well as IYA Sushi & Noodle Kitchen, all located in the Village Commons, across College Street from Mount Holyoke College, as well as a bar called the Halfway House Lounge on Summit Street. He described that establishment as the ‘Cheers’ of South Hadley, meaning everyone there knows your name. They also know the story of how the tavern got its name, which Yee was more than willing to share. Yee told that story to convey the strong sense of continuity that exists in this Hampshire County community, and how many things haven’t changed since the Halfway House started serving pints soon after Prohibition ended more than 80 years ago. But many things have changed, and for evidence, one need only look further down Newton Street, to one of Yee’s latest entrepreneurial ventures. He’s one of the principals — Peter Pan Chairman and CEO Peter Picknelly and Rocky’s Hardware President and CEO Rocco Falcone are the others — in a closely watched development at the so-called Woodlawn Plaza, former home to Big Y but more recently a mostly vacant eyesore of sorts. Retail centers of this type couldn’t be classified as easy money or even a particularly wise investment at this point given the way the retail sector is heading, but this group of entrepreneurs moved to acquire the plaza at auction because of confidence in their abilities to bring new life to it, and also confidence in South Hadley itself. This confidence results from historically steady results in South Hadley when it comes to retail and business in general, but also many recent developments that have secured the community’s place as a reputation of sorts when it comes to everything from outdoor activities to fine dining. Take the Village Commons, for example. It’s at 100% occupancy, essentially, and has been since roughly the start of this century, said Jeff Labrecque, the facility’s chief operating officer. “We have very, very little turnover, and when something does turn over, we usually fill it very quickly,” he said before getting his point across by noting that O’Connell Care at Home will be moving its headquarters there in several weeks, quickly claiming a 1,900-square-foot space vacated by River Valley Dental after a consolidation of that operation. O’Connell’s move brings still more diversity to the Commons, which already had a good amount of it, said Labrecque, adding that it’s home to restaurants and bars, high-end apartments that are in demand (he says there are maybe 50 people on a waiting list, and some have been on it for years), many health and beauty businesses, service agencies, a still-surviving independent bookstore, and a still-surviving two-screen movie theater. All of this makes the Commons a true destination, he said. The broader goal is to make South Hadley itself more of a destination, said all those we spoke with, adding that many pieces to this puzzle are in place, and more are coming together. Mike Sullivan is better known for his time spent serving the community on the other side of the Vietnam Veterans Memorial Bridge — he was mayor of Holyoke for a decade after owning and operating Nick O’Neil’s tavern — but he now resides (professionally speaking) at South Hadley Town Hall. He’s been town administrator for several years, taking that position after serving the town of Maynard (famous as the home to Digital Equipment Corp., Monster.com, and later Curt Schilling’s ill-fated 38 Studios). In fact, Sullivan’s first day in Maynard was Schilling’s last, and he remembers the town being very upset and frustrated with losing the company, emotions that shifted went it quickly dissolved into bankruptcy. But that’s another story. This one is about South Hadley, and Sullivan said it has achieved progress in many forms in recent years, including the broad realm of economic development, attracting new companies such as Mohawk Paper and E Ink Corp., and retaining others, such as South Hadley Fuel. The town is also making headway with recreation-related initiatives such as a bike-share project and what he called the ‘river-to-range trail program,’ which, as that name suggests, is a handicap-accessible trail route that starts at Brunell’s Marina on the Connecticut River and connects to the Summit House in Hadley on Mount Holyoke. Such initiatives bring more people to the town and thus the benefits that go with that visitation, he explained. But easily the most-watched project in the community involves the Woodlawn Project on Newton Street, Route 116. The goal is to create a mixed-use development, said Sullivan, adding that the town is working to create what’s known as a ‘40R,’ or Smart Growth Zoning Overlay District, at the site, which would allow for more flexibility with regard to both zoning and eventual development. That plan will go before town meeting later this spring. The site, formerly home to a large Big Y and Food Mart before that, still has a few tenants and is anchored by a Rocky’s Hardware store, but is still largely vacant. The new owners have torn down the 65,000-square-foot former Big Y, have plans for a larger Rocky’s with a garden center, and are hoping to attract more retail at a time when that sector is clearly struggling, but also other types of tenants. “Retail is struggling, with Toys R Us, BonTon, and other national chains going out,” said Yee, adding that, in many properties like the one on Newton Street, restaurants have become the main anchors. Elaborating, he said that dining and entertainment businesses have played a major role in making a South Hadley a destination not only for those living in neighboring communities such as Granby, Holyoke, and Amherst, but for residents across the region and even beyond. This is certainly in evidence at the Village Commons, which has always been a gathering spot, but it is now even more of a destination — because of its array of eateries, but also the diversity of ventures there. Indeed, there are now more than 70 businesses with that address on their letterhead, and while all of them serve people living around the corner (or upstairs, when it comes to those with apartments in the complex), they are also drawing people from many surrounding communities into South Hadley. The complex’s many restaurants are perhaps the main attraction, said Lebrecque, noting that there are now several of them. In addition to the Yee family’s offerings, there’s also Tailgate Picnot, Food 101 Bar & Bistro, New Main Moon Café, WOW Frozen Yogurt, and the Mexican restaurant Autentica. This critical mass gives the Commons both diversity and drawing power, said Lebrecque, who drew comparisons, on some level, to the city of Northampton and its thriving downtown. But retail is also thriving in the Commons, in part because of the foot traffic created by the entertainment options, he went on, citing, as one example, Moxy Boutique. This is a relatively new addition — it arrived about a year ago — led by an entrepreneur who left a stable, successful situation in Suffield, Conn. for the Commons because of its destination status. And there are others who would like to gain inclusion on the tenant directory, he went on, but there isn’t any space available. If that sounds like a good problem to have, it is. Such a development means your facility — and the community — are in demand, a preferred landing spot, and a great place to live, work, and operate a business. South Hadley is all of those things, and has been since people starting gathering at the Halfway House Lounge — long before it was called that. The goal here is to become more of a destination — for businesses, families, outdoor enthusiasts, those looking for a boutique, and those looking for a new weed whacker. 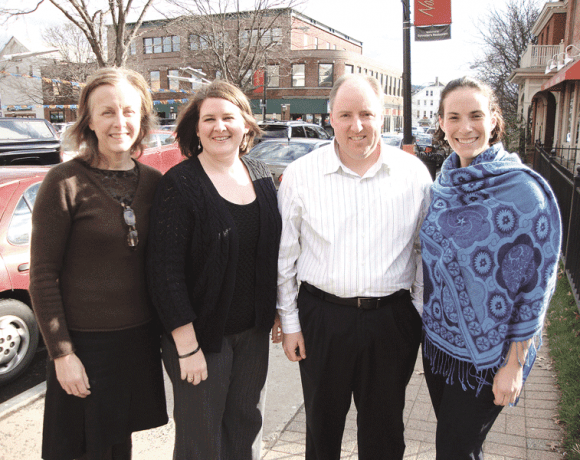 And South Hadley is making strides toward being that destination.